Mangaluru, 05 Apr 2018: MCHD Group and National Health Mission along with Health Department partners and ONGC-MRPL as a CSR Arm held a Mangaluru Rural Medical Mission at Laxmi Janardhana Mahaganapathi Temple at Yelinje near Kinnigoli. Patients from all caste, creed and religion benefitted from the speciality check up conducted by CHD Group team members. 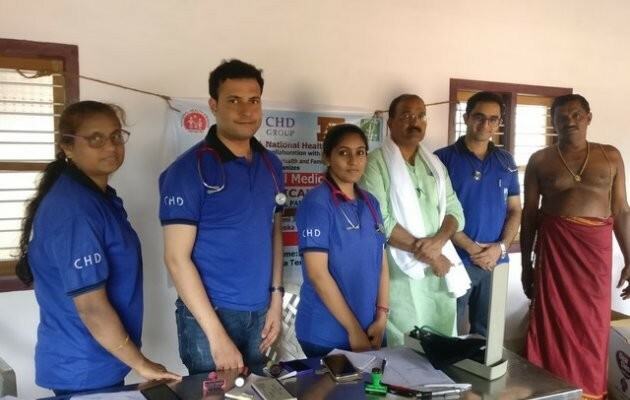 Dr. Edmond Fernandes, CEO, CHD Group led the team for the rural medical mission. Dr. Niveditha Sai Chandra, Neurologist, Dr. Sanjay Kini, Community Health Physician were other experts at the camp. The Temple administration of Laxmi Janardhana Temple mobilized the patients in need of healthcare service along with Prof. Clarence Miranda. Nava Chetana Yuvaka Mandala assisted in spreading the word towards this humanitarian effort. Several requests for more such interventions which also factored in environmental concerns like water, sanitation and hygiene were made by the patients to Dr. Edmond Fernandes to conduct on a regular basis.